As was the norm in those days, Suddodana invited sages to prophesise his son’s future. What he heard filled with him with both joy and fear. They told him that Siddhartha would ether become a great ruler or a great spiritual leader. Afraid to lose his heir, Suddodana filled his son’s life with luxuries and a beautiful wife, cocooned from hardships. But who has been immune to life and its pain? One day Siddhartha ventured out of his palace and as was inevitable, saw the “Four Passing Sights:” an old crippled man, sick man, dead man, and a holy man with no home. A turning point, it led him to leave his palace, wife and son, in the middle of a dark stormy night in search of life’s meaning. He practiced extreme self-denial like thousands of others also in search of answers, but apart from turning him into a bag of bones, it achieved naught. Undeterred, he seated himself under a bodhi tree in Bodh Gaya and decided he would meditate till the truth dawned on him. Forty-nine days after meditating, and six years after walking on his own path he received enlightenment, and became Buddha the enlightened one. Unsure whether the world was ready to learn and accept his learnings, he held his first sermon in Sarnath. Encouraged by the response he went on to travel the length and breadth of central and north India barefoot holding discourses along the way, till aged 80 he “died” in Kushinagar when his soul decided to leave its human form. His followers continued to spread his word far and wide across Asia. Though Buddhism as a religion dissipated in India and was wiped out by Muslim invaders in the 1200s, it had spread to Burma, China, Indochina, Japan, Thailand, and Tibet by then where it continues to flourish. For the Buddhist, the holy pilgrimage circuit centres around four significant touch points in Buddha’s life. Where he was born [Kapilvastu aka Lumbini, in Nepal], where he was enlightened [Bodh Gaya], where he gave his first sermon to his faithful five companions who stuck by him through his journey in search of answers [Sarnath], and where he finally received parinirvana, a deathless state [Kushinagar]. It is important to note that although people “worship” Buddha, he never claimed to be god. Nor did he ever deny or support the existence of a god per se. He simply stressed that each person had the capacity within themselves to become enlightened—to understand suffering and to be free from suffering. A monk and a budding pomegranate, both amongst the ruins. And I wonder if there is a hidden message in its synchronised colouring. Sri Lankan monks circumambulating the Chaukhandi Stupa, site where Buddha was reunited with his five companions after enlightenment. Lotuses placed by a pilgrim at the brick ruins of the ancient Mulagandha Kuti Temple in the Sarnath archaeological site. Dhamekh Stupa with Dharmarajika Stupa in the foreground. When Siddhartha Gautama Buddha first taught the Dharma—the four noble truths and eight-fold path—and founded the first sangha or community of 61 monks including himself in Sarnath, the place was a forest filled with frolicking deer. The “deer park” now pushed to a corner of the site edges an excavated area comprising stupas, monasteries, and temples built mainly during the Mauryan (322 – 185 BC) and Gupta (320 – 550 AD) periods, and the 12th Century. An air of serenity wraps the entire site. Pilgrimage groups guided by their head priests stop at the landmarks for a sermon followed by chants. Orange-robed monks sit under trees deep in meditation whilst squirrels run around them. The only sound is that of birds and the hum of mantras. Compact, well-marked with detailed signage, Sarnath allows you to experience the place without getting bogged down trying to figure it out. May I also add, it is best to go early in the morning or late in the afternoon. Better lighting and cooler! The site’s highlight is without a doubt the Dhamekh Stupa which marks the believed-to-be-exact-spot where Buddha’s first sermon was held. The event is known as Dharma Chakra Pravartana or setting the “wheel of law” in motion. 28.5 metres wide at its base and 33.35 metres high, the lower half of the solid cylindrical tower is encased in sandstone punctuated with niches in eight directions and a broad band of elaborate carvings. Next to the stupa are the extensive ruins of Dharma Chakra-Jina-Vihar, a massive 12th Century monastery 232 metres in length, built over the ruins of several earlier monasteries. According to an inscribed stone slab found during excavations at the site it was donated by Kumar Devi. She was the Buddhist queen of Govinda Chandra, King of Kannauj. Dharmarajika Stupa, a flat circular stupa, was built by Buddhism’s most devoted, famous, and powerful follower to date—the Mauryan emperor Ashoka (272 – 232 BC)—to enshrine the relics of Buddha. Ashoka apparently opened seven original relic stupas and collected the relics for redistribution to thousands of stupas. Dharmarajika Stupa was one of them and contained a relic casket of green marble. Jagat Singh, diwan of Raja Chet Singh, King of Benaras pulled down the structure in 1794; he needed bricks to construct a market in Benaras. The exposed relic basket was thrown into the River Ganges, with prayers I hope. Flowers are still offered at the ruins of Mulagandha Kuti, a temple marking the spot where Buddha used to meditate. Once 61 metres high, raised on a square platform 18 metres wide, it was fronted with a mandapa facing east. All that remains now is rubble and the lower walls—but these are enough to help one envision its original grandeur. Behind this temple is the site’s second highlight—the fragments of the 15.25-metre-high monolithic polished chunar sandstone pillar erected by Ashoka. It used to be topped with the iconic lion capital, now the national emblem of the government of India. The pillar bears three inscriptions. The earliest is a 3rd Century BC edict by Ashoka in the Brahmi script in which he warns the monks and nuns against creating divisions in the sangha. The other two inscriptions date back to the Kushana (60 – 375 AD) and Gupta periods respectively. Sarnath with its glorious monuments fell into disrepair after the Muslim invasions from the 1200s onward. Luckily for the world, a Mr. Duncan and Mr. Cole Mackenzie wrote about the green marble casket unearthed at the Dharmarajika Stupa in 1798. This initiated a series of excavations by Alexander Cunningham in 1835–36, founder of the Archaeological Survey of India, and subsequent ASI archaeologists. The findings, spanning a period from the 3rd Century BC to 12th Century AD are housed in the nearby Sarnath Museum. I loved the fine detailing on the monuments. Though most of the sculptures have been moved to the nearby Sarnath Museum, the remaining pieces are pure poetry. Top right: The niches in Dhamekh Stupa were used to hold effigies of Buddha. Chaukhandi Stupa is 500 metres away from the archaeological site. Buddha met his five companions here after enlightenment. Edict on the sandstone pillar by the Mauryan emperor Ashoka ordered the sangha to stay united. A terraced four-armed brick stupa, Chaukhandi was built during the Gupta period (4th – 5th Century AD). It marks the probable spot where Buddha met his five companions after enlightenment; these five men went on to become his first five followers. The stupa is topped with an octagonal Mughal tower (1588) in honour of Humayun’s Sarnath visit. Built first during the Mauryan period, and added to in the 6th Century AD and 1026 AD, the 33.35-metre-high Dhamekh Stupa’s original name was Dharma Chakra Stupa. It is believed to be the exact place where Buddha preached his first sermon. Together with Lumbini, Bodh Gaya and Kushinagar, it forms part of the Buddhist pilgrimage circuit. One of the finest museums in India, the collection houses sculptures excavated at the Sarnath archaeological site. Two masterpieces will take your breath away: the stunning 3rd Century BC lion capital from the Ashoka Pillar [now India’s national emblem] and a gigantic 2,000-year-old stone umbrella embellished with Buddhist symbols. A modern temple built in 1931 by the Mahabodhi Society just outside the archaeological site, Mulagandha Kuti Temple has gorgeous frescoes. They are painted by Kosetsu Nosu, Japan’s foremost artist, and look like animation stills. The temple is built on the lines of its ancient counterpart which lies among the brick ruins of Sarnath. Burma, China, Japan, Thailand, and Tibet have all built modern temples in the Sarnath complex, each unique in style. My favourite is the Tibetan monastery with its beautiful wall paintings and chanting hall. If you promise not to create a ruckus, the red-robed monks are happy to let you join them in the chanting. Frescoes by Kosetsu Nosu, a leading contemporary Japanese artist, decorate every inch of the inside walls of the Mulagandha Kuti Temple (1931). Top: Chanting with the monks at the Tibetan Monastery; Below: Effigy of Buddha at the main altar with Padmasambhava in the foreground. Padmasambhava [Sanskrit for lotus-born] was a tantric Buddhist master who established Tantric Buddhism in Tibet in the 8th Century AD and set up the first monastery in the region. Sarnath archaeological site ticket and timings: Rs. 15 for Indians, Rs. 200 for foreigners; open 7 days a week from sunrise to sunset; Photography allowed. Sarnath Museum ticket and timings: Rs. 5 for Indians, Rs. 100 for foreigners; 9:00 am – 5:00 pm, closed on Fridays; Mobile phones and cameras are not allowed inside the museum. Sarnath is 11 kilometres north-east of Varanasi. Getting there: Auto rickshaws are available in Varanasi for round trips to Sarnath at Rs. 500 for 4 hours. Add another Rs. 100 for every extra hour. 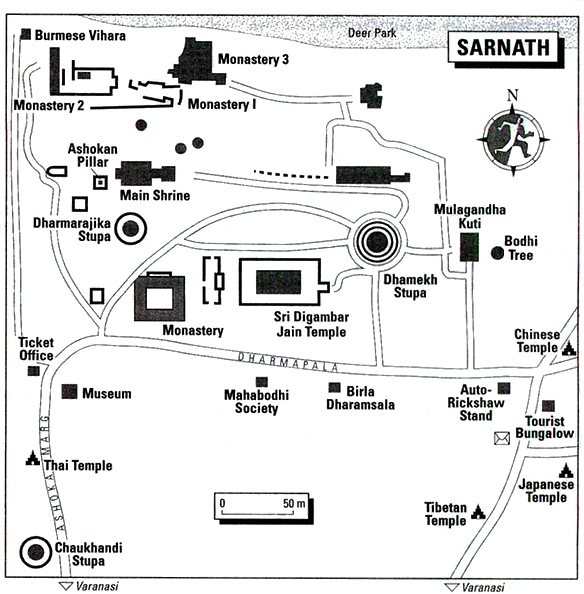 uptourism.gov.in has a fantastic map of Sarnath which I found extremely useful. To download it click here. This entry was posted in Exploring India, Uttar Pradesh and tagged Archaeological Survey of India, Ashoka Pillar, Buddha's First Sermon, Buddhist Pilgrimage, Chaukhandi Stupa, Dhamekh Stupa, Dharma Chakra-Jina-Vihar, Dharmarajika Stupa, Gautama Buddha Life Story, Kosetsu Nosu, Lion Capital, Mulagandha Kuti, Sarnath, Sarnath Museum, Sarnath School of Sculpture, Things to see in Sarnath, Tibetan Monastery, UP Tourism by Rama Arya. Bookmark the permalink. Hello Anindya, am so glad you enjoyed the post and found it useful. I loved Sarnath. Guess it shows in the post. 🙂 Bodh Gaya is still on my to do list. Hopefully next year.